FileHippo Update Checker (naturally by FileHippo) is one of the few update checkers I actually find usable. It had not got much attention in posts because it is very simple (and suffers from my I-mentioned-this syndrome). After all I decided to do a bit more specific post about extended settings of the app, that aren’t immediately obvious but can be highly useful. On normal operation Checker interface just flashes briefly and sends you to page with scan results right away. This straightforward process is what makes it highly convenient, but overshadows the fact that Checker is also customizable. As you see on screenshot above there is Settings link/button that will interrupt scan process and give you window with available options to change. Latter is most interesting feature as for me. By default Checker will only scan common software locations, which is inconvenient in many cases (extensively using portable software is clearly one). 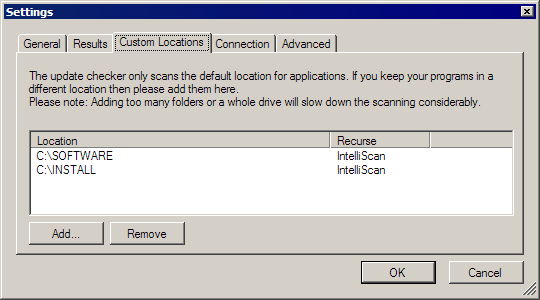 Adding additional locations extends scope of scan and Checker is smart enough to pick portable versions of applications that have no traces in registry or default install location whatsoever. While Update Checker excels at simplicity it doesn’t forget to offer settings that maximize compatibility and convenience when required.